I’m hosting a fundraiser to help Evan. At six months of age, Evan was abandoned at a train station in China. It was late December of 2008 that in desperation, his home orphanage called New Day Foster Home, a haven for critically ill orphans in China. Evan was near death, weighing only 10 pounds at age 2 1/2. He couldn’t walk or talk. Now his future is bright. His photo was placed on the Rainbowkids.com web site. A family on the other side of the world was at the point of suspending their search for a child to adopt. The W family felt a calling to adopt a special needs child, yet a salary cut and the economy were weighing heavily on them. They will go to the moon and back to make to bring him home. How could they not? He was born to be their son. They have watched from afar, through photos and letters, as Evan has gained weight and gained strength. He went from near death and despair to a hopeful little boy full of joy! The next step is the hardest step, and that is bringing Evan home. He has yet to meet his loving parents, M and C, to play with his brother and sister, to be embraced by his grandparents, aunts, uncles and cousins. In order to make Evan’s journey complete, there are legalities: background checks, medical forms, authorizations, passports, signatures, deadlines and the seemingly endless red tape that binds this process. As many adoptive parents know, the hardest part of adoption is the cost, and that applies whether the child is in the next town or half way across the world. It all comes down to money. Thousands of dollars are required to complete the process, and unfortunately that is the one detail that keeps so many potential forever families from ever bringing home a child in need. M and C are forging ahead, with support from family, friends and church, with fundraisers big and small. They can afford daily life and they have the love, commitment, stability and excellent health insurance to cover Evan’s ongoing special needs. But it’s the expenses they have today, to complete the paperwork, purchase plane tickets and hotel for the required trip to China, that they need some help with. Help comes in the form of donations, big and small. My sister is running the Chicago Marathon as a fundraiser to help Evan’s forever family with expenses. I am hosting a Pampered Chef party in my home, with profits going to Evan’s Forever Family. The money will help bring Evan home. The funds we raise will help finish the paperwork, buy airfare and a set of traveling duds for Evan, and help him make the trip of a lifetime. 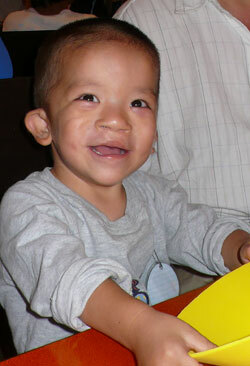 This boy has special needs and he has a special family waiting for him. You can help! You can be a part of this miracle! Simply by placing an order on my show, through my consultant’s website, you will be supporting Evan too. Since I can’t publicly post the web site, please leave a comment with your email (which I will moderate and delete your email address for your privacy!) and I will send you the link to my party. This entry was posted in Uncategorized and tagged Evan, fundraiser. Bookmark the permalink. I won't be able to purchase much but I want to help. God bless these people for wanting to adopt that precious little boy! And God bless YOU for stepping up to the plate to help make that happen.